Mike Baron and I speaking on Comic Book Creator Rights at Phoenix Comicon 2014 – Mike says this photo is proof that the “gurus” could not levitate. 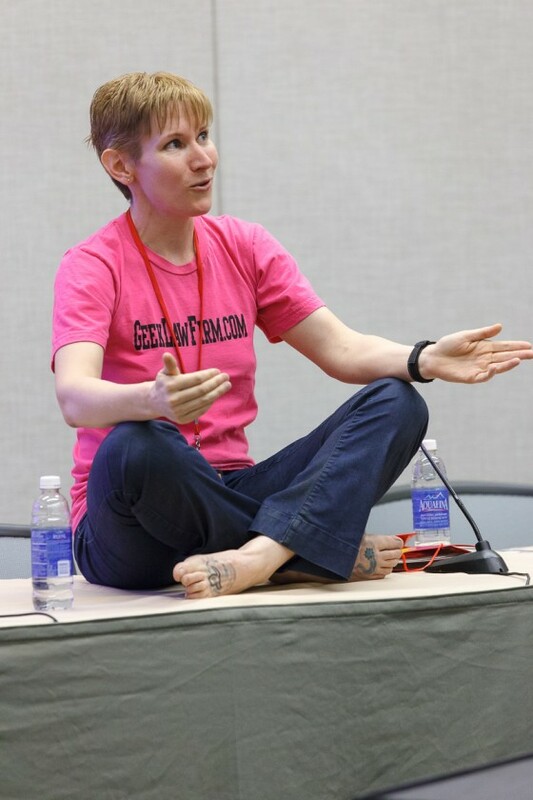 Earlier this month, I spent the weekend speaking at Phoenix Comicon. I was on two panels: Comic Book Creator Rights (with Mike Baron) and Copyright and Fan Fiction/Art (by myself). The lineup at this year’s event was amazing and included Stan Lee, Cary Elwes, Nathan Fillion, and the original Batman cast (Adam West, Burt Ward, and Julie Newmar). There were also workshops on writing and costume-making, a huge exhibitor room, and the best geeky game show – The Phoenix Ultimate Geek Smackdown. Needless to say, no one was coming just for me, and I didn’t have line of people waiting to attend either of my panels. But I had about 30 people at each session and those that came were truly interested in the subject matter. I heard a rumor before my first panel that my co-presenter wasn’t too enthusiastic about being on a panel with a lawyer. We’d never met before and I’m sure he did what I did, which was no advanced research. I bet he assumed I’d be boring, stuffy, dry, and wearing a suit. I suspect he didn’t expect his legal eagle co-presenter to be in jeans and a hot pink t-shirt that said GeekLawFirm.com. 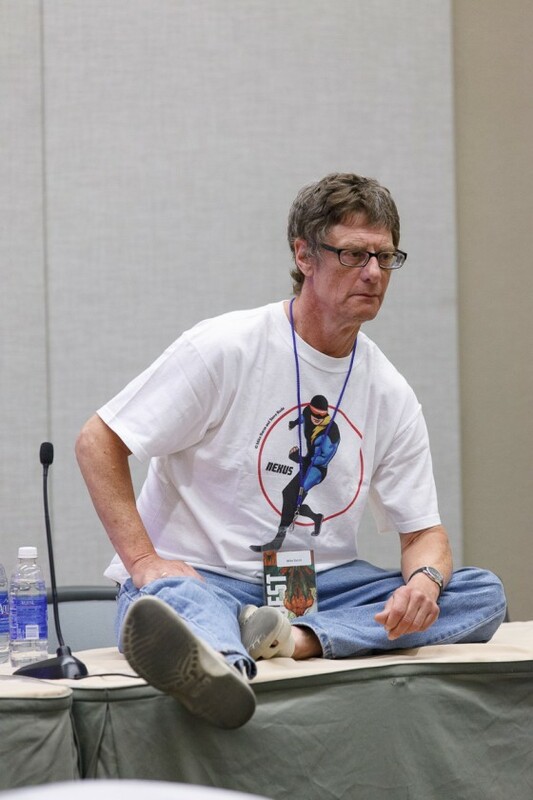 I got to our room before him and I did what I typically do when I present at Phoenix Comicon – I took off my shoes and plopped myself down on top of the table. There’s something about sitting on the table that makes me feel energized and free-spirited. Unfortunately, Mike walked in through the back entrance so I didn’t get to see the look on his face when he first saw me. He said hello and took a seat behind the table but then I declared that we were doing our panel from on top of the table. He humored me and climbed up. (I’m not sure he knew what to think at that moment.) I spent most of our panel gleefully swinging my legs and they dangled over the edge of the table while we fielded the audience’s questions. Our panel went really well. I provided some basic information about copyright, trademarks, and contract terms, and he got to talk about how these things actually play out in the professional comic writing world. I think it was great balance between academic and practical knowledge from both of our perspectives. I often forget that there’s a strong stereotype about what a lawyer is and that many people assume that I’m boring and that my material is dry. When people ask me to speak at their event, it’s not uncommon for them to say, “She’s a lawyer, but she’s not that kind of lawyer,” when they tell people about me. Photos by Erik Hawkinson, used with permission.